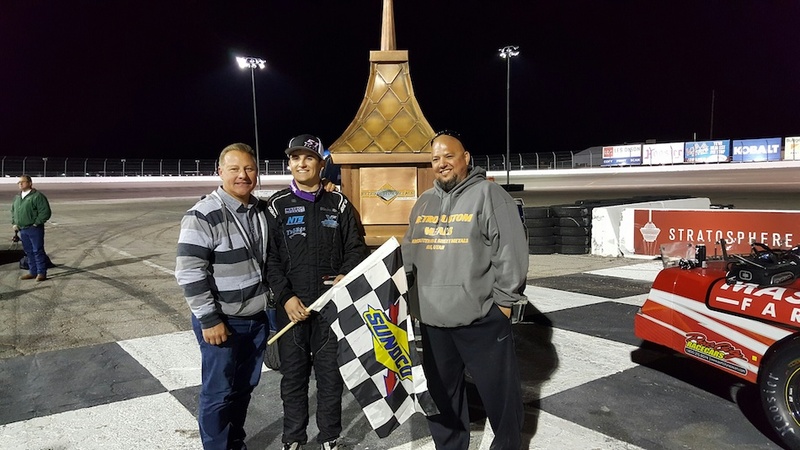 The SPEARS (SRL) Southwest Tour Series concluded their sixteenth season with a first-time winner, while crowning a three-time champion, during the running of the “Retro Custom Metals 150 presented by Pinnacle Peak Steakhouse”. 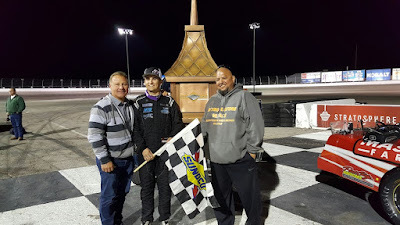 Blaine Rocha finally captured his first career series win at The Bullring at Las Vegas Motor Speedway, while Derek Thorn was able to secure his record tying third championship, to join Jim Pettit II in that category. Christian McGhee was formally crowned the series Rookie of the Year, in a season that saw him earn the Rookie of the Race Award, in all nine points paying events. The Rocha effort was quite remarkable in itself, as he went from hero to zero and back again. Blaine's roller coaster weekend began with practice, in which he was only four one-thousandths off of Thorn's quick time. Practice ended with Blaine's Chevrolet in the pit exit wall, after hitting speedy dry while exiting the track at a high rate of speed. The result was a destroyed race car, and a return to his All American 400 car, that brought him home seventh in that event. “We spent all day Friday getting our primary car really good, but we pulled this red car out and it was just as fast. I think in the race it might have been even faster”, Rocha commented. Derek Thorn set fast time, for a series record 39th time, over the track record 36 car field. His 14.187, on the three-eighths mile paved oval, was also a new track record. Blaine Rocha was a surprising second quick, followed by Donny St. Ours, Jeremy Doss and Ryan Cansdale. The large field necessitated a B Main Event, to transfer three cars, in which to fill out the 30 car field. Justin Simonson, from Colorado, was the winner of that event, with Luke Hall second, and Jason Gilbert making a late race pass of Scott Sanchez, to claim the final Main Event position. The top eight cars in qualifying redrew for starting positions in the feature event, with Rocha pulling the one pill to start on the pole. Bobby Hodges started second followed by Donnie St. Ours, Bullring Open winner Linny White, Jeremy Doss, Derek Thorn, Ryan Cansdale and Brandon White. When the field went green, Rocha jumped to a quick lead, but the yellow came out on lap 2, when Jeremy Doss pulled into the infield with a broken driveshaft. It was a disappointing result for the Montana 200 winner, who had lead several practice sessions during the weekend. The ensuing restart only lasted a few more laps, when a chain reaction accident eliminated 2015 SPEARS Southwest Tour Series Champion Jacob Gomes. Upon the next green, the field calmed down and ran the next 30 circuits without incident. Rocha pulled away to a comfortable lead, but the top 5, and the rest of the field was in constant flux. Only two additional minor yellows saw the field reach the completion of the first 75 lap segment. Rocha led Bobby Hodges, Derek Thorn, Eric Richardson, Ryan Cansdale, Brandon White, Linny White, Craig Raudman, Trevor Huddleston and Christian McGhee to the break, with a total of 18 cars still on the lead lap. The lap 75 restart saw Rocha once again jump out to a lead, in the highly preferred lower groove. Thorn was able to follow Rocha with Hodges dropping all the way to fifth, in the outside line. With 32 laps of green flag racing, Thorn was able to stay within striking range of Rocha, but contact with the lapped car of Cale Kanke was a major setback to his effort. The lap 107 caution, for Matthew Meech and Andre Prescott, would set up a revolving door for the second place position battle. Thorn, Cansdale and Hodges would exchange the position multiple times, with each new restart. There was hard racing throughout the top ten, but by the lap 134 caution, Thorn had once again regained the second position, after battling inside of Cansdale for five consecutive laps. For Cansdale, the caution could have been a stroke of luck, as he was showing the rare strength of being able to compete in the outer groove. The ensuing restart, however, ended Cansdale’s chance for victory, when a spin in Turn 2, sent him to the rear of the field. The final restart of the race, on lap 140, saw Rocha leading Thorn, Hodges, St. Ours, Brandon White, Christian McGhee, Linny White, Eric Schmidt, Keith Spangler and Eric Richardson. The single file restart, by rule, found Rocha jumping out to another quick lead, with Thorn slowly loosing contact. The battle for third saw St. Ours get under Hodges, with B. White and McGhee following. B. White would take third from St Ours, two laps later, and McGhee would wrestle that position away from White in the next turn. That would not last, however, as accordion type contact, between the group, found White back to third, with McGhee in pursuit. As the laps wound down, White and McGhee found themselves closing on the ill handling Thorn machine. On lap 148 White was able to get under Thorn for second, with McGhee securing third on the final corner. Thorn was able to hold on to fourth followed by Hodges, St Ours, John Nesmith, Richardson and Cansdale, with Eric Schmidt rounding out the top 10. It was a dominating performance by Rocha, who had grown stronger as the season neared completion. For Blaine, it was a victory that was a long time in the making, and showed the strength of both he and his team. Christian McGhee finished third, with a car that also came to life late in the event. Even though he didn’t win the $10,000 first place prize, he was happy for his teammate who did. Christian began, “You know, this is a $10,000 to win race, so everyone wants it. We didn’t have anything for the 21 car (Rocha), but I am so proud of them that their team went out on top. I would’ve obviously liked it to be me, but there is no one else that I would rather see win this race. I am proud of Blaine, and he is a good teammate.” Christian continued, “I’m so proud of my guys. Something happened in the last 15 laps and this baby came to life. I wish it would have happened earlier, and I don’t know if it was the driver or the car, but track position here is so key, we just didn’t have it. This team had a good run this year, as we were the only team to finish in the top 10 in every race. I’m proud of them, and what we have accomplished this year, and hopefully I’ll have something for next year, so please come and pick me up”, Christian laughed. Derek Thorn finished fourth in the event, but claimed the biggest prize of the season, with his third championship. Bobby Hodges was the final driver in the top 5, but was mixing it up with the top group the entire race. With 10 to go he was in third position, but managed to hang on to that top 5. “On that last restart it got a little dicey and everyone was bouncing off of each other, so I ended up falling back to fifth. I’m not going to lie to you though; it was a lot of fun. It was some good hard racing with some good drivers, so I can’t complain”, Hodges recalled. The SPEARS Southwest Tour Series now heads for its winter break, with the momentum of two consecutive records car counts. The next event will be the 2017 Winter Showdown on February 9-11, 2017. Final Results: 1) Blaine Rocha, 2) Brandon White, 3) Christian McGhee*, 4) Derek Thorn, 5) Bobby Hodges, 6) Donny St. Ours, 7) John Nesmith, 8) Eric Richardson, 9) Ryan Cansdale, 10) Eric Schmidt, 11) Linny White*, 12) Matthew Meech*, 13) Keith Spangler, 14) Carlos Vieira, 15) Justin Simonson, 16) Andre Prescott*, 17) Dan Holtz, 18) Jason Gilbert, 19) Trevor Huddleston*, 20) Luke Hall*, 21) Cale Kanke*, 22) Craig Raudman, 23) Ricky Schlick*, 24) Lance Wilson*, 25) Bob Lyon, 26) Stan Mullis, 27) Dennis Furden*, 28) Jacob Gomes, 29) Toni McCray, 30) Jeremy Doss. *Registered SPEARS Southwest Tour Series Rookie of the Year Candidate. DAYTONA BEACH, Fla. (Nov. 23, 2016) — The fans have spoken. More than 47,000 votes were cast world-wide for the 2016 NASCAR touring series’ Most Popular Driver Awards and six drivers have earned the honor of fan favorite. The list includes four repeat winners – Melissa Fifield, Trey Hutchens, Jason Hathaway and Alon Day. There was also nearly an historic first: Hutchens, who competed in both the K&N Pro Series East and Whelen Southern Modified Tour this year, finished a close second to Theriault in the K&N Pro East voting while taking the top honors in the Whelen Southern Modified Tour for the second straight year. Fifield won the award for the third straight season in the Whelen Modified Tour. 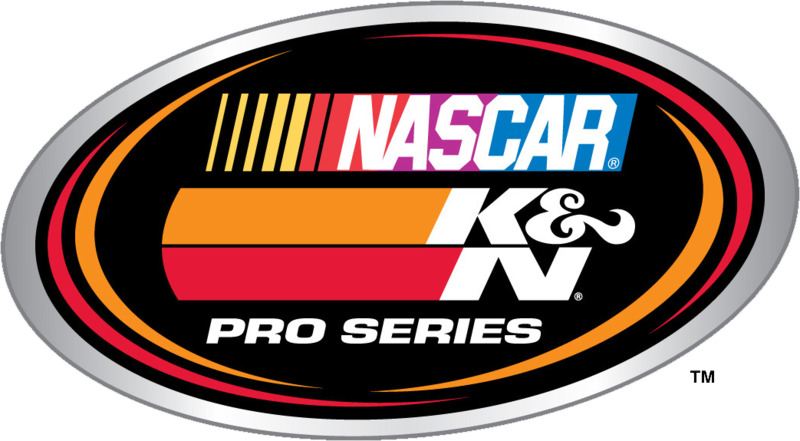 Iovino emerged in front in a close three-way battle in the K&N Pro West with Jesse Iwuji and series champion Todd Gilliland. Hathaway, who announced he was retiring from full-time competition after racing in all 121 events in series history, ran away with the award in the Pinty’s Series. Day, who was selected to the NASCAR Next program as one of the sport’s rising stars, won the award for the second consecutive season. The award was open to any driver who competed in at last half of the races in their respective series. Monday, Elliott Sadler (NASCAR XFINITY Series) and Tyler Reddick (NASCAR Camping World Truck Series) received the Most Popular Driver Award for their respective series in their awards gala at the Loews Miami Beach Hotel. The NASCAR touring series Most Popular Drivers will be recognized on stage as part of the NASCAR Touring Series Night of Champions on Saturday, Dec. 10 at the Charlotte (North Carolina) Convention Center at the NASCAR Hall of Fame. Happy Thanksgiving fellow racing fans. After enjoying the warmth and fellowship of spending Thanksgiving day with family and friends, you might want to consider a racing road trip where two paved oval tracks, located in Arizona, will be presenting some very good shows this Saturday. TUCSON SPEEDWAY. 3/8 MILE TUCSON, AZ. www.tucsonspeedway.com SATURDAY, NOVEMBER 26TH. Tucson will be presenting their annual "Turkey Shoot" show this Saturday night featuring two of their very best divisions running special length main events. Highlighting the evening will the super fast Super Late Models who will be running a 125 lap main event that pays $3,500 to the winner. Adding to the on track excitement will be the speedway's very popular Pro Truck division who will be treating their fans to a 50 lap main event that pays $1,000 to win. Adding to the Saturday night fun will be Auto Soccer and high flying, bar banging, moto and quad jumping. The spectator gates will open at 5pm with the racing going green at 7pm. All of this racing is also budget friendly. General admission tickets, age 17 plus, are only $12. Tickets for seniors, age 55 plus, and military personnel are $10. Tickets for juniors, age 11 to 16, are $7. Kids age ten and under will be admitted free but must be accompanied by a paid adult. The speedway also offers a budget friendly family package, value priced at $30, that admits two adults and two juniors. HAVASU 95 SPEEDAY. 1/4 MILE. LAKE HAVASU CITY, AZ. www.havasu95speedway.com SATURDAY, NOVEMBER 26TH. The Havasu 95 Speedway will be presenting their traditional Thanksgiving weekend special racing show, with the very clever name of "Nitro Turkey Racing", this Saturday afternoon. This event is a special day race. The spectator gates will open at 12pm with the racing action receiving the green flag at 2pm. This full day of winter season racing is being presented by the Anderson Group and Pinstriping By Chris, (909 208 7016). The famed quarter mile paved oval is located within the Sara Park complex in beautiful Lake Havasu City, Arizona. Providing the on track action will be the speedway's Late Model division, the Office Cocktail Lounge Bandoleros, the Sam Nichols Electric Factory Stocks, and the Flower Assisted Living Team Factory Stocks. There will also be a special appearance from the Pony Stocks with many of their team towing in from Southern California the location of their home track: the Orange Show Speedway. General admission tickets, age 17 plus, are $12 and $10 for seniors, age 55 plus, military personnel and the handicapped. Kid's tickets, age six to 16, are $6. The speedway also offers a budget friendly family package, value priced at $25, which admits two adults and two kids. Fans can also enjoy the special amenities of the speedway's VIP package, featuring the best seats in the house, for only $25. The speedway's Late Model division will be making their 2016 - 2017 winter season debut this Saturday and will treat their fans to a 100 lap main event. Trevor Huddleston, the 2015 - 2016 reigning is expected to be on hand to defend his title. He can expect plenty of competition from drivers Bobby Keirns, a former Havasu Late Model champion, along with Jeff Peterson, Matt Goodwin and Mark Allison. All of these competitive drivers finished in the top five of the championship points at the conclusion of last year's winter racing season. The Sam Nichols Electric Factory Stocks will be making their fifth appearance of this season this Saturday afternoon. Jeff Prieur has been the division's hot shoe so far and leads the championship points standings with 203 points based on a consistent three feature wins and a runner up finish. However, he's only nine points ahead of driver Chris Blackwell who had logged four top five finishes, with two of them being second place runs. The Flowers Assisted Living Team Factory Stocks is a concept that features three rotating drivers. The series will be making its second appearance of the current winter season season this Saturday afternoon. The aforementioned Jeff Prieur won the division's first main event with Jose Guevara finishing second. The series' teams will be racing on a special oval carved out in the speedway's dirt infield area which should present a strong challenge for the drivers as well as a high level of entertainment for the fans. The Office Cocktail Lounge Bandoleros will be making their second appearance of the winter racing season. Brock Rogers won the series' season debut and will go into next Saturday afternoon with a two point advantage, in the championship standings, over Ethan Deguevara. In fact, there are only 13 points the top eight drivers in those current points standings which indicates that the series is going to have an extremely competitive season. Remember, when you watch these youngsters race, you may very well be watching the future driving stars of tomorrow. 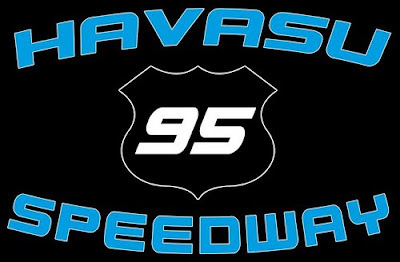 For more information, regarding the Havasu 95 Speedway's 2016 - 2017 winter racing season, dial up their official website at www.havasu95speedway, com or visit their Facebook page. 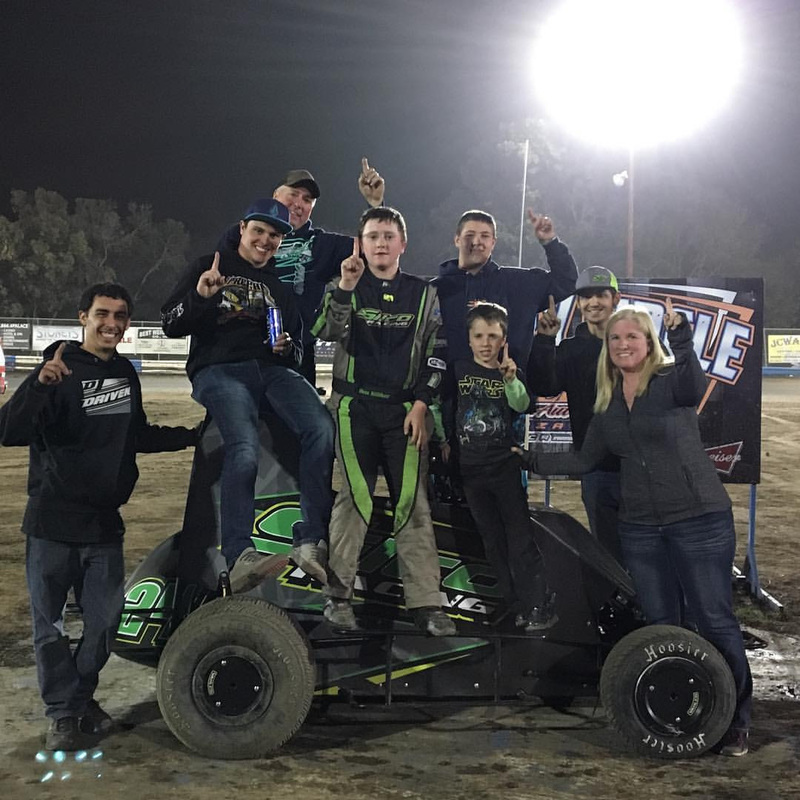 LEMOORE, CALIFORNIA (November 22, 2016) – In the third different type of race car this season, 11 year-old Ben Silliker took a place in the history books as the youngest in his field. Saturday night, Silliker became the youngest known Non Wing Micro Sprint race winner in the nation at Plaza Park Raceway. The Turkey Night victory gives Silliker 11 main event wins on the year. 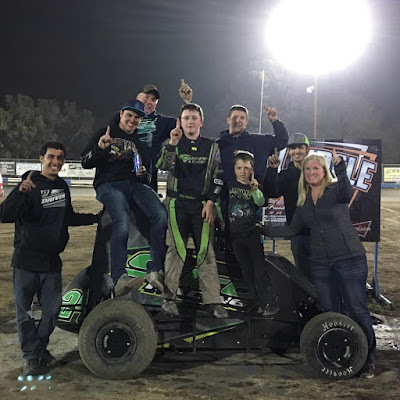 His 2016 historic accomplishments include becoming the youngest feature starter in the Kyle Larson Outlaw Kart Showcase and the youngest winner in the Jr. Late Models at Madera. Both of those accomplishments took place during Silliker's busy September. Silliker has accumulated 70 feature starts thus far this year across the three divisions. His younger brother Alex, his Team Silco Racing teammate, is nearing 40 starts this season as well. Both nights of racing at Plaza Park in Visalia, CA included full main events with Ben Silliker running double duty in Non Wing Micros and Outlaw Karts on Friday night. Silliker flipped in the Non Wing feature, but had a strong showing in the open 500cc Outlaw Karts in a rare Plaza Park appearance to finish third. Alex Silliker ran just outside the top-five with a sixth place run in Jr. Sprint. The focus turned to Saturday night with just Non Wing and Jr. Sprint on the menu. The focus paid off with Ben Silliker fending off a late race charge from Mason Daniel to claim the feature win and put himself in the history books. Very few tracks in the country allow drivers under 12 to compete in Non-Wing, with Silliker at the very least the youngest in 2016 if not in Micro Sprint history to win a Non-Wing main event. The big win is part of a busy stretch going back to September 17th where the youngster has finished no worse that 9th in Non-Wing. Alex Silliker ran seventh in the Jr. Sprint competition on Saturday as well. Team Silco Racing's season does not have any signs of slowing down, with the two day Thanksgiving Nationals at the Chowchilla Barnburner on tap for Friday and Saturday night. The indoor Outlaw Kart events have been rapidly growing. Ben Silliker has finished first and second in his two starts at the bullring this year. Fast Four Media will have live coverage of the weekend's activities at www.FastFourMedia.com Silliker's win at Madera Speedway in the Jr. Late Models on September 24th will air Thursday December 1st on MAVTV. The show airs at 5 pm and 8 pm Pacific and is also available on the Lucas Oil Racing app.